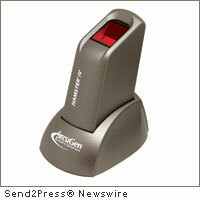 SANTA CLARA, Calif., Oct. 12, 2011 (SEND2PRESS NEWSWIRE) — SecuGen, the world’s leading optical fingerprint device vendor, is pleased to announce that the FBI has certified the SecuGen Hamster IV(TM) v2 fingerprint reader as meeting Personal Identity Verification (PIV) Single Finger Capture Device Specifications. The Hamster IV v2 is the successor to the widely deployed Hamster IV fingerprint reader. This new version of the Hamster IV fingerprint reader retains the high image quality, rugged design and affordable price of the previous version and adds faster image capture and compatibility with both USB 1.1 and USB 2.0. SecuGen will be releasing the Hamster IV v2 at a date to be announced. The Hamster IV v2 is part of SecuGen’s growing line of fingerprint biometric products that are PIV compliant, as defined by the FIPS 201 standard. This line also includes the iD-USB SC/PIV(TM) that combines fingerprint and smartcard readers, the SDA04 OEM module for use in physical access devices, the SDU04P OEM sensor for use in USB peripherals, and SecuGen’s Pro SDKs for the development of FIPS 201/PIV software applications. SecuGen PIV compliant products are used in a growing number of U.S. government, civilian, and military agencies and increasingly by governments and corporations around the world. – Image 300dpi: Send2PressNewswire.com/image/11-1012-hamsterv_300dpi.jpg . – Image Caption: SecuGen Hamster IV v2 fingerprint reader. Original Keywords: Dan Riley, CEO Won Lee, fingerprint biometric products, SecuGen Corporation, FBI Personal Identity Verification, PIV Single Finger Capture Device Specifications, SDU04P OEM sensor, fingerprint recognition technology, SecuGen Hamster IV v2, Santa Clara California SecuGen Corporation Santa Clara California SANTA CLARA, Calif.
REFERENCES: Biometrics and Bioware News, Dan Riley, CEO Won Lee, fingerprint biometric products, SecuGen Corporation, FBI Personal Identity Verification, PIV Single Finger Capture Device Specifications, SDU04P OEM sensor, fingerprint recognition technology, SecuGen Hamster IV v2, Santa Clara California SecuGen Corporation Santa Clara California SANTA CLARA, Calif.